What is the advantages of using LED lighting for my aquarium? Where are Eco-lamps lighting LED fixtures available for purchase? What kind of warranty if offered for Eco-lamps LED light, and how do I obtain warranty service? Can the intensity of the lights be controlled? Is it normal for the fixture to feel warm to touch? What forms of mounting options are available? Where can I get a copy of the User Manuals? What type and brand of LED bulbs are used in Eco-lamps Lighting fixtures? What is the color temperature of the lights? What is the proper duration of time to program for each light stage? How can I become a reseller or distributor of Eco-lamps Lighting products? What are the advantages of using LED lighting for my aquarium? Advances in LED technology have propelled it to become the top choice for satisfying the aquarium illumination needs of reef enthusiasts. LEDs have many benefits over other popular forms of aquarium lighting, including metal halides and T5 tubes. High-output LED lighting, such as our model KRV5, generates enough power to maintain and grow even the most demanding SPS corals as revealed in our initial head-to-head PAR value test. LED lights have proven to be far more energy efficient that metal halides, requiring far less energy. Reef hobbyists can expect further savings in monthly electricity bills due to another characteristic of LEDs - unlike metal halides, our LED lights radiate heat away from the water, which can significantly reduce or eliminate the need for a chiller. Our specially designed and manufactured LED bulbs have a life expectancy of approximately 50,000 hours, or over 5 years of typical use. Both metal halides and fluorescent tubes must be replaced significantly more often, and light reduction is much more drastic over the lifespan of these types of bulbs. All of our fixtures contain White and Blue LED bulbs which enables various automatic light stages – Daylight, Sunrise/Sunset and Moonlight, to simulate the natural light cycle and create stunning illumination which really shows off your aquarium. LED lights emit only a fraction of the UV radiation compared to metal halides, eliminating the danger to light-sensitive corals. Eco-lamps is building a reliable network of selected quality retail stores to offer our products and provide a high level of quality customer service to reef enthusiasts across the nation. These authorized resellers are carefully selected to carry our line of LED lights because they possess the knowledge and experience to match you up with the best aquarium lighting solution. You can visit one of our selected retailers to view our lights, If you could not find a contact in your country, please contact the nearest region or us. We deliver items on the next 10 working days after you placed your order. Please note that courier service's office opens on Monday to Saturday, except Sunday and public holiday. Items ordered on Saturday, Sunday and the day before public holiday will be delivery on the next working day. What kind of warranty if offered for Eco-lamps LED light? How do I obtain warranty service? Eco-lamps Inc. warrants all of our LED lighting fixtures, including the power supply, against defects in material and workmanship under normal use for a period of 1year from the date of original purchase. Therefore, users should read the user manauals with the product carefully as misuse or failure to follow the instructions may render this warrantly void. 1 year warranty will be provided from date of purchase. We have designed the LED controllers in KR90, KR93, KR94 and KRv5 that can be easy to set the intensity of the light from 0 -100%. Although an advantage of using LED lighting is that heat is radiated away from the water, heat will still be generated by the bulbs. It is necessary to dissipate the heat to ensure the maximum durability and reliability of the electronic components in the fixture, including the controller and LED bulbs. The advanced design of Eco-lamps fixtures utilizes heatsinks to transfer the heat from the fixture, keeping the internal components cool. It is normal to feel warm air escaping from the top surface of the light. In addition, because the KR93 higher power output produces a greater amount of heat, internal cooling fans are used to further dissipate the heat. Because of this additional cooling mechanism, the surface of the KR93 will feel even cooler than the KR94. In addition, multiple fans are used in each fixture, ensuring the fixture has sufficient cooling any of the fans fail. The surface of many less advanced designs of LED lights may feel cool to the touch. Not a good thing! This is an indication that the heat generated by those lights is trapped inside the fixture, with no means of escaping. LED fixtures designed without adequate heat dissipation will suffer from poor performance and premature breakdown of the components. 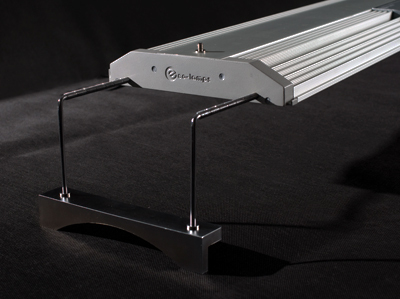 All Eco-lamps LED fixtures are shipped with both ceiling hanging kits (can be suspended up to 6 feet from the ceiling) and mounting brackets, allowing you to customize your system. Whether you choose to mount the lights on the tank or use the hanging kit, our stylish and sleek KR series LED lights are sure to complement the look of your aquarium. The KR93 uses 3 watt LED bulbs with similar specifications as Cree XPG. We drive 3 watts to each bulb can potentially cut down their production costs by reducing the number of bulbs and lenses used, but this comes at the expense of reliability and efficiency. In contrast, in order to maximize longevity, increase longevity, and maximize lumens, we only drives approximately 1 to 1.3 watts to each bulb. The KRV5 uses 400nm, 420nm, 450nm, 470nm, 500nm, 4000K and 7000K LEDs with Cree XTE and XPE chips that ensure the maximum reliability and efficiency. We are closely working with a select number of top LED bulb manufacturers who are committed to developing specially produced bulbs most suitable for aquarium lighting. The color temperature for the White LEDs is 4000K and 7000K, the rest are 400nm, 420nm, 450nm, 470nm and 500nm. The length of time you should program for each of the various light stages will depend on a number of factors, including the size of your tank and the lighting demands of your specific corals. The programmable controller gives you the flexibility to tailor the use of the LED lights based on the specific needs of your tank. We recommend initially programming the "Daylight" stage (Lighting Stage "t2") to last a duration of 5 hours, then closely monitoring how your corals react. From there, you can adjust for a longer or shorter cycle. There are no other LED aquarium light in the market that can match the power, efficiency, durability and design of Eco-lamps Lighting's fixtures, and likewise, we want to build a quality distribution channel that no one else can match. If you have a retail store or are a distributor and are interested in carrying our line of products, please email us at info@eco-lamps.com Please try to include recent photographs of your store and display tanks for us to make a better assessment. The Frequently Asked Questions (FAQs) section is the primary resource for you to find answers to any questions you may have. We will continuously improve and expand this section with as much information as possible, so please keep an eye out for updates to the FAQs.